caption Top view (elongate oval shape) and valve view (rectanular shape) of Achnanthes, grown in culture from fresh Kinneret water. 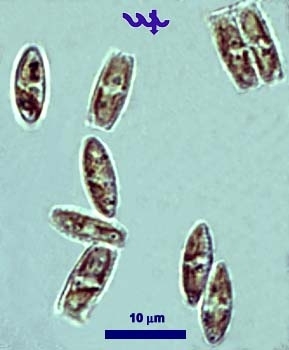 At least 3 species of this genus occur in the lake, mostly in the littoral zone in the benthos but also in the plankton and as epiphytes. Achnanthes usually grows on agar when we try to isolate other species from the lake plankton.